Few times in my life have I ever read what I would call “a dangerous book.” I’m talking about content that leaves you questioning your thinking and challenges you to live differently—something that disrupts life. Today, we’re releasing a dangerous book. I had the privilege of writing the foreword and in it I said this new book from Ralph Moore and Jeff Christopherson will “change the way you think” and “mess with your scorecard.” Ultimately, it will change how you view your success and how you plant churches. 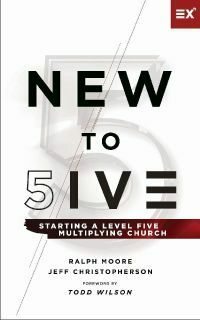 As we’ve seen this book come to fruition, I’ve repeatedly told our team that out of the 100+ books we’ve published from Exponential (including some of my own), that New to Five: Starting a Level 5 Multiplying Church is my favorite one we’ve done. In our recent ebook, Dream Big, Plan Smart: Finding Your Pathway to Level 5 Multiplication, we introduced the six multiplication pathways that churches can take to move from their current level to the level they aspire to be. Over the next few months, we’ll be releasing eBooks from leaders, focusing on each multiplication pathway. We’re honored to have such venerable voices like Ralph’s and Jeff’s on this first title in this “pathways” series. As one of the few Level 5 multipliers in the United States, Ralph Moore has led the Hope Chapel movement that produced 2,300+ churches. In New to Five, he shares the story of the Hope Chapel movement and how he began to plant churches that multiplied from day one. Jeff leads the North American Mission Board’s Send Network, and in this book he plays the role of commentator to bring his experience and observation to this ongoing story of Kingdom movement. I first met Ralph and Jeff while Exponential was researching multiplying churches. We were having an extremely difficult time finding multiplying churches in the United States. In fact, our team couldn’t identify even five rapidly multiplying churches with a sustained record of reproduction to the third and fourth generation. Enter Ralph and Jeff. I love being around these guys. These leaders are giving their lives to church multiplication, and they’re committed to helping as many other leaders as possible. If you’re serious about creating a culture of multiplication and replacing the prevailing addition-focused measures of success with more biblically rooted metrics and multiplication scorecard, this book was written for you! It’s full of practical content written by practitioners for practitioners. I believe it’s one of those watershed works that church experts will look back on in 10 years and conclude it was a key catalyst in seeing the percentage of churches in the United States that ever reproduce increase from less than 4 percent to greater than 10 percent. Exponential is laser-focused on this “4 to 10 mission.” We’re committed to building an expanding library of high-quality, practical books to help church leaders embrace multiplication and put their dreams into action.